This is 5.56 Lake City XM855 62gr. 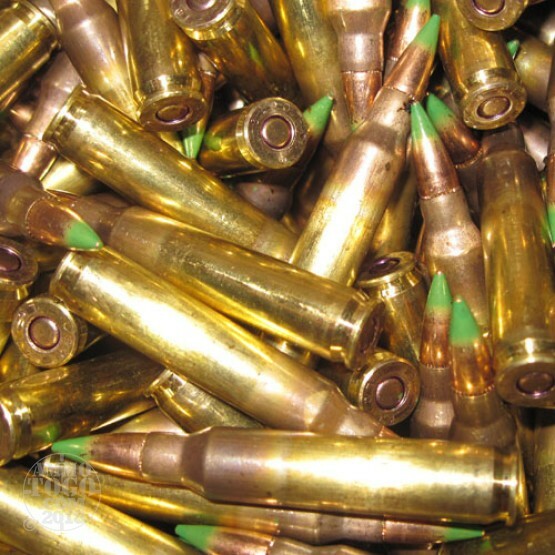 Full Metal Jacket Green Tip Penetrator Ammo. This is original Lake City manufactured ammo. It is headstamped 2011 - 2012 and it comes packed loose. It is brass cased, boxer primed, non-corrosive ammo. This is a follow up to the review on the 1,000 rounds of XM855 that I posted earlier. The 500-rd order was much better. There were no discards of the 502 rounds that arrived. There were plenty of cosmetic blemishes and a lot of small indentations from the noses of other rounds, likely due to the loose pack. These were headstamped Lake City, NATO, 2014. Very pleased with this order. I cautiously ordered 500 rounds for two reasons - ammunitiontogo.com is new to me and a low rated review. I shoulda ordered more. This is 100% typical USGI bulk. The only anomaly I could see was primer sealant was sparse to missing. I've noticed that on late LC from other sources. Maybe that is why it got surplused. Roll them to check for concentricity, pick out the mashed rounds, wipe off the boogers, then have a blast. I haven't shot them yet so didn't give 5 stars. This was some of the ugliest looking ammo I've ever seen. I went through it while I was putting it on stripper clips and had to get rid of about 30rnds because they were severely dented. Every other round had black tar substance? that had to be scraped off. I knew I was not buying match ammo when I bought this stuff but I didnt expect trash either. Hope it shoots a lot better than it looks. Great ammo I have shot about 1500 rounds with only a 1% failure rate not bad. Real clean stuff!